There were three main reasons I wanted to read this book. 1) Simple curiosity over what sort of work an asteroid hunter does 2) the fact that this is connected with the TedTalks series, and 3) my son is studying to be an astrophysicist and I’m curious about what sort of jobs he might be looking at in the not-too-distant future. So, what is an asteroid hunter? It is someone who is studying and mapping space in our solar system and plotting the courses for all the large rocks (asteroids) that could pose a threat to the earth should they be on a collision course. It’s not a fast-paced action sort of job. It’s a lot of slow, methodical work. And as Nugent points out, much of the population isn’t too worried about an asteroid strike. When was the last one? The last devastating strike? But thanks to some ‘near’ misses recently, and some Hollywood doomsday flicks featuring asteroids as the evil killer, asteroid hunting has gotten a little more recognition. It’s probably pretty difficult to talk about something that requires a good commit of physics without getting too technical and I have to admit that there were times, even in this slim book, that the science got a little too technical for me, but Nugent does a fine job of keeping it simple for those of us who are pretty simple laymen. A couple of things that I hadn’t thought too much about before… those meteor showers that we enjoy watching (for me it’s usually on those August nights) – those “streaks of light are caused by very small rocks; most are about as big as a grain of sand, some as large as a pea.” And as Nugent adds: “It’s pretty amazing when you think about ; you’re actually able to see the flash from something as small as a grain of sand from over (60 miles) away.” That is pretty incredible, and it does make you pause and consider what it might be like if that rock were even as big as a car. One other thing that I picked up on (among other things) is that the telescopes used for asteroid hunting can vary. The type that Nugent herself works with sees the sky in infrared. Asteroids may be dark rock and would only reflect the light of the sun if at the correct angle or if the sun were not blocked by another object. But all objects are warmed by the sun to some degree, and an infrared telescope will see an object that a ‘normal’ magnifying telescope wouldn’t. It’s amazing how many asteroids are already discovered and tracked and amazing how many more might actually be out there, but I do feel better knowing that there are people like Nugent keeping the planet safe from giant rocks. Looking for a good book? 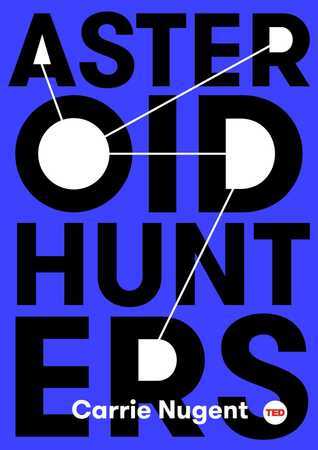 Asteroid Hunters, by Carrie Nugent, is a brief but thorough examination of what some people do to track the space in our solar system to make sure there are no asteroid on an intercept course with the earth, and if there are, to give our leaders time to take action.